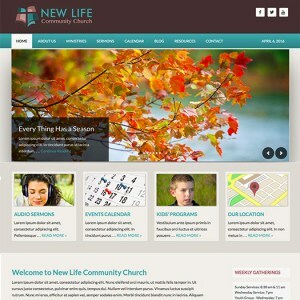 The perfect balance of warm and cool tones greet the visitor with this new WordPress church theme built to run seamlessly with the Genesis framework. This represents the first in our exciting new Evangel series of themes. This new series is designed to provide a warm, inviting front-end experience, while making customization and management a snap with an intuitive back-end admin. Running seamlessly on the popular WordPress Genesis framework, this new Christian community theme renders well on whatever web-ready device your members and visitors are accessing it with. And as you can count on with CMS Themefactory, this new WordPress church theme comes with all of the photos you see in the live demo, as well as the full, easily installable live demo import file. That means you can get your church website up and running with ease and speed. And from there the user-friendly admin will allow you to make whatever customizations you desire.